Harley-Davidson® Women's Sporty Script Short Sleeve Tee features a Harley-Davidson® script printed on front. This short sleeve tee is finished with our exclusive Manchester Harley-Davidson® Henna Art dealer backprint. 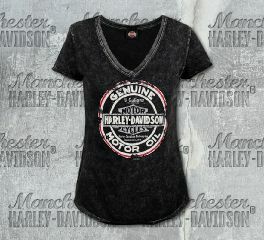 Harley-Davidson® Women's Notched Skull Black Short Sleeve Tee is made from 100% cotton. It features a skull graphics, and studs embellishment on front and finished with our exclusive Manchester Harley-Davidson® Henna Art dealer backprint. 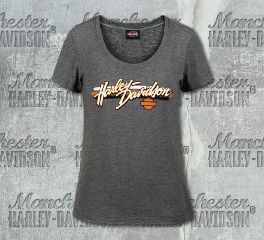 Harley-Davidson® Women's Genuine Round Short Sleeve Tee is made from 100% cotton. It features a genuine round graphics printed on front, and finished with our exclusive Manchester Harley-Davidson® Henna Art dealer backprint. 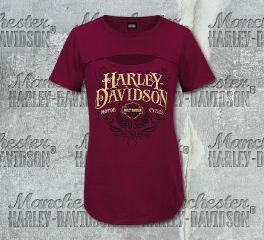 Harley-Davidson® Women's Berry Logo Short Sleeve Tee is made from 100% pure cotton. It features a classic Bar & Shield® logo printed on left chest, and finished with our exclusive Manchester Harley-Davidson® Washed Down Eagle dealer backprint. 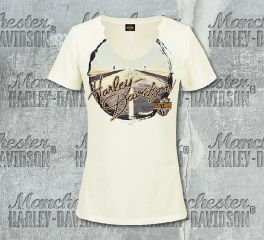 Harley-Davidson® Women's Harley® Way U-Neck Short Sleeve Tee is made from 100% cotton. It features a studded Harley-Davidson® lettering, and printed road graphics on front. 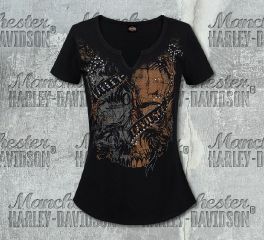 It is also finished with our exclusive Manchester Harley-Davidson® Henna Art dealer backprint. Harley-Davidson® Women's Sculpted B&S® Short Sleeve Tee is made from 100% cotton. It features a stone embellished Harley-Davidson® lettering, and peep front design which is really eyes captivating. This short sleeve tee is finished with our exclusive Manchester Harley-Davidson® Henna Art dealer backprint.